Readers may appreciate this – when you’re reading book after book and all you really want is to read a story you can completely submerge yourself in to the point where when you open the covers and begin to read, from that moment on you forget all around you. For the most part this year I have been reading the same story and it’s not that it’s an uninteresting story or lacking entertainment. The story so far has been interesting, entertaining, and humorous at times and I love the characters, but as much fun as I have had reading it I haven’t been so thoroughly absorbed when that’s what I’ve been wanting. And now I have found a story that has met my wishes, finally. 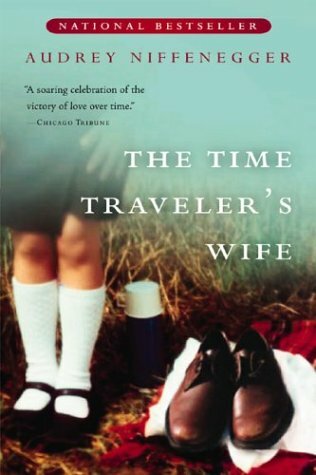 I have just finished The Time Traveler’s Wife by Audrey Niffenegger after several days of blissful and utter submergence (which I’m finding hard to get myself out of now that the story has finished) and this is a book I would normally not have read. I doubt I would have read it at all if it didn’t have time travel and wasn’t the book of the month for my forum, especially with the way the synopsis is written. This is something that pisses me off because the synopsis doesn’t always completely portray what’s in between the covers and therefore a lot of people may miss out on a well written, engrossing story like I almost did (because I’m not a fan of romance). I love how Niffenegger writes. I love how she portrays these characters, her descriptions, how she uses the idea of time travel as a genetic disorder and how she can put together a story following a time line that’s all over the place and not have it fall apart like it so easily could. You go from past to present to future and it’s seamless and gives the feeling of a piece of fruit. Fruit? I know this is probably going to be one of the shittiest analogies, but the other objects I have popping into my head are a dividing line of sorts and a leveller. Think of a piece of fruit. An orange (because I’m hungry and craving one) that’s being cut down the middle and the sides fall apart to reveal the textures and lines, but don’t look at them as if they are just the innards of this orange, but roads and patterns leading somewhere while being connected all at the same time. And then see the fruit come together again without the knife as if someone has filmed it and omitted the knife via editing. Once again the fruit is whole and all is connected, but at the same time you know that there’s more then what the outside of the fruit presents. There’s roads diverging on the inside and intricate patterns. This is the impression I get form this story. It’s like Niffenegger has cut right down the middle, but is telling the stories from two halves and she’s making them whole. The characters and their growth fit beautifully with the story, the ending ends it all perfectly, and I think I’m in love with this book. I think I might be in love with Niffenegger’s style. I also think I have to go have lunch before I start rambling nonsensically.